The two critical environmental factors involved in properly storing potatoes and preventing common potato diseases are temperature and humidity. Adequate and unrestricted air movement is also necessary to maintain constant temperature and humidity throughout the storage pile—and to prevent excessive shrinkage from moisture loss and decay. Bruising and cuts can occur during harvesting and handling. Wound healing is critical in order to minimize the entry areas for ever-threatening organisms of potato diseases. Temperature is critical at this phase of initial storage, as healing proceeds most rapidly at temperatures of 60°–65° F. In order to achieve the healing of any wounds, this temperature, plus high humidity, facilitates the forming of a suberin layer (similar to a scab on animals). The suberin layer develops in three to five days. Cell regeneration, or complete wound healing, can take place beneath this suberin layer within 10 to 20 days, depending on the condition of the potatoes. When potatoes are placed in storage, rapid cooling can result in more rot-forming organisms in the tuber because the entry points remain unhealed. Rapid cooling, particularly in the absence of adequate air, can also result in black spot and other potato damage. Most common potato disease organisms increase their population growth at temperatures ranging from 40° to 80° F. Lower temperatures lessen the possibility of disease incidence during storage. Since many of the common potato storage diseases naturally occur in the soil, they are transported into storage with the tubers. It is essential, therefore, not only to heal the exposed wound areas to minimize pathogen penetration, but also to lower the temperature as soon as possible after storing to minimize disease spread within infected tubers as well as from infected to sound tubers. This fact emphasizes the importance of careful harvesting and handling techniques to minimize bruising, skinning, and cutting. If late blight, other diseases, or field frost damage are evident in tubers, rapid lowering of temperatures, even without the healing and curing period, may be necessary to prevent breakdown. However, do not store these damaged potatoes for long periods of time. The potato tuber reacts like any living organism; respiration increases with increasing temperatures. When the respiration increases so does the tuber weight loss. 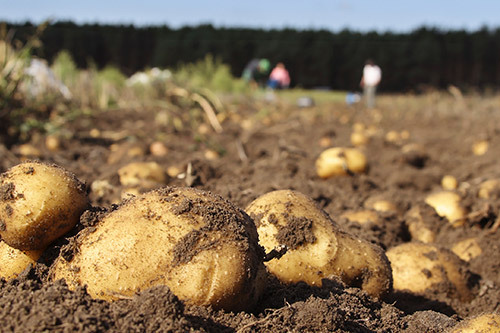 Since lower temperatures also maintain dormancy, keep temperatures as low as possible without otherwise decreasing quality (e.g., sugar buildup in processing potatoes). For long storage periods of three to five months, depending on the variety, a sprout inhibitor is practical for potatoes other than those to be used for seed. Low temperatures (45° F. or lower) enhance sugar formation. If the storage temperature is maintained below 45° F. for a long time, accumulated sugars in the tuber do not readily reconvert to starch (recondition). High-reducing sugar concentrations result in undesirably darkened potato chips and fries. Some varieties recondition better from low temperatures than others. In general, the optimum, long-term storage temperature for processing potatoes is approximately 45° F. For fresh market potatoes, a temperature of 40° F. is recommended. Seed potatoes may be stored at slightly lower temperatures (38° to 40° F.) for better weight loss and sprout control. Maintain a 95% relative humidity at all times. High humidity is essential for optimum wound healing during the curing period. It is also essential during the entire storage period to minimize tuber weight loss. At relative humidity levels below 90%, weight loss rapidly increases. Air movement may not be necessary during the curing period because the heat and moisture generated by the potatoes may provide an environment that is favorable for wound healing. Do not allow free moisture (condensation) to form during storage. If that does occur, air circulation may be necessary. Thereafter, air movement may be required to maintain the desired temperature and humidity throughout the storage pile. This may also require passing humidified air and/or heated or refrigerated air through the pile. From 10 to 20 cfm (cubic feet per minute) of air per ton of potatoes is usually optimum, but the exact amount depends on the temperature of the outside air being brought in—warmer temperatures make more air necessary. 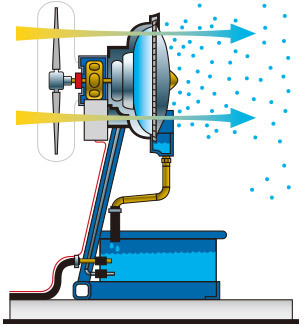 The primary function of air movement is to maintain a uniform temperature and humidity. Intermittent air movement can also accomplish this goal. The key is continual, accurate monitoring. Dirt and clods are a problem that can seriously affect air movement through the storage pile. They tend to form a solid barrier that slows down air movement and prevents air from reaching some areas of the pile. Cold potatoes are brittle and may easily bruise or shatter during handling. Before removing the tubers from storage, raise the temperature to 50° to 55° F. This can sometimes be accomplished by removing ventilation, which allows the heat from tuber respiration to accumulate. More frequently, however, heaters and/or forced ventilation of warm air is necessary. Minimize bruising, skinning, and cutting during harvesting and pre-storage by very gently performing the entire operation. Remove clods and dirt before putting the potatoes into storage. A wound healing or curing period is necessary to prevent entry of rot organisms and to reduce water loss. Wound healing occurs most rapidly at 60° to 65° F., with 95% humidity, and requires from 5 to 20 days. If blight, other diseases, or frost damage is already present, it may be necessary to minimize or bypass the curing period. The holding period requires low temperatures of 45° F., 40° F., or 38° F. for processing, fresh market, or seed potatoes, respectively. Maintain 95% relative humidity. Removal period: raise temperature to 50° to, 55° F. by discontinuing ventilation, or by using heaters and/or ventilating with warm air. Source: Cooperative Extension, University of California, in cooperation with the United States Department of Agriculture. IVI offers Jet-Ag and Fruit Gard for further protection for your stored potatoes. IVI offers Jet-Ag service for application at the moment of storage, or at the first sign of disease. FruitGard is another option for protection, and is easily applied. For more information on which is the best option for your operation, we offer a comparison. IVI offers design, systems, and equipment for complete optimization of your root crop storage. Visit with us to explore the best solutions for your storage needs. Sign up for our mailing list to receive more product and industry information and news!